Lorene Ruby (Blades) Davidson, 96, of Billings/Republic, Missouri, passed away Friday, July 27, 2018. She was born August 8, 1921 in Greene County, Missouri, to Earl and Tressie (Lovett) Blades. She lived in Southwest Missouri at different times during her long life, spending the last 35 years on the same land where she lived as a small child. At the age of nine her family moved near Lamar, Colorado where she spent the next ten years. 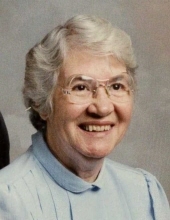 After graduation from McClave High School in 1939 she began her life in nursing and in caring for others, first in Wiley, then at a hospital in Colorado Springs, where she worked as a nursing aide from 1940-1944. She and her sister Bonnie returned to Springfield, Missouri in December 1944, where they worked at the old St. John’s Hospital. In June 1952 she married James H. Davidson, and together they raised four sons in Springfield and Kansas City, Kansas. She put her nursing career on hold during much of that time but continued to work when she could in nursing homes and as an on- call sitter in hospitals and in private homes. In 1983 she returned to the Billings, Missouri area to help her brother care for their ill sister and aging parents. James joined her in 1987. She remained at that home until the end of her life. To know Lorene was to know a person who was dedicated to caring for others. Whether in the home or at the hospital, she always put the wellbeing of others first, making many personal sacrifices along the way. She was preceded in death by her husband, James; parents, Earl and Tressie; sisters, Bonnie Garrett and Pauline Blades; brother, Donald Blades; and nephew, Robert Garrett Jr.
She is survived by her sons, Jerrold, Allan, Steven (Judy) and Thomas; her grandchildren, Amy Pixton, Travis Davidson, Shiloh Davidson, Brandy Davidson, Christy Desai, Steven Davidson Jr., and Kelly Andrews; nieces, Donna Herron and Robin Shoemaker; nephews, Richard and Ronald Garrett, as well as 18 great-grandchildren. To send flowers or a remembrance gift to the family of LORENE RUBY DAVIDSON, please visit our Tribute Store. "Email Address" would like to share the life celebration of LORENE RUBY DAVIDSON. Click on the "link" to go to share a favorite memory or leave a condolence message for the family.